We have a very exciting giveaway for our readers this week. 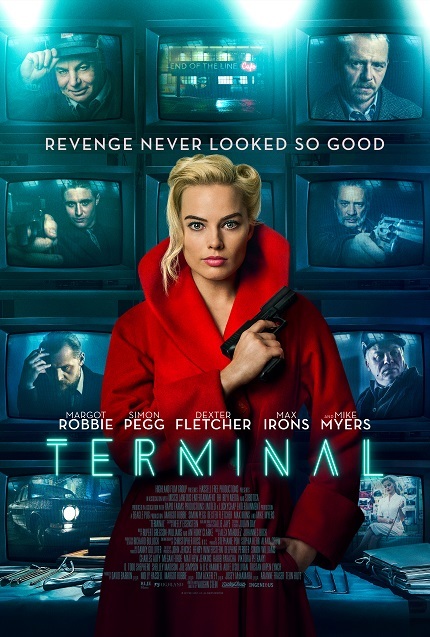 Vaughan Stein's directorial debut Terminal, starring Margot Robbie, Simon Pegg, Mike Meyers, Dexter Fletcher and Max Irons, will be available on DVD and Blu-ray on June 26, 2018. Screen Anarchy has one (1) Blu-ray and one (1) poster, signed by Stein, Robbie and Pegg, to give away to one lucky reader. To enter you must be a resident of the U.S. and correctly answer our fact finding question below. All correctly answered entries will be entered into a random draw next Tuesday, June 26th. All entries must be submitted by Monday, June 25th at midnight PST. Ready? Vaughan Stein held many jobs on many high profile studio productions: Harry Potter, World War Z, Beauty and the Beast. Look at Vaughan's and pick five jobs. When you have picked five jobs email us here and you will be entered into the random draw on Monday, June 25th. Good luck to all who enter.